Well, I sure would like to have YOUR treat:) And your pizza in your last post looks amazing! My treats are usually ice cream or frozen yogurt. I haven't had anything REALLY special lately. Oh, I take that back. When I was in Nashville a couple of weeks ago, I had a pc. of cheesecake at the Cheesecake Factory. It was pretty yummy! The last treat I ate was a HUGE thing of frozen yogurt last night at a nashville blogger meet up. We all got the peanut butter and latte flavors and had them swirled together. HOLY sweet treat!! Looks fabulous. Last treat...some fresh chocolate chip cookies this weekend, but I'm planning on making a treat tonight or tomorrow! Love nutella....everything with nutella tastes great! That Nutella is making me drool! I've never had it, is that crazy or what?! The last treat I had....was peanut butter chocolate chip ice cream at UDF (United Dairy Farmer's). It was AMAZING, with huge chunks of peanut butter (better than mine, so sad). OMG that looks heavenly. I had some rocking desserts at Sweet Tomatoes the other night :) MMMmm chocolate mousse. it was RICH and so so good! that banana bread looks FAB! The last treat I had was the rainbow cake I showed on my blog from the Jewish holiday. We have tons left over so I may go have a piece soon. I love the gobs of chocolate on the rainbow cake. Nutella AND banana bread!!!! OMG, you are killing me with your delicious temptations! *note to self* make banana bread...soon!!! There's nothing better than banana, bread and nutella. Yum!!!!!! holy moly lady...you just took this completely and fabulously OVER THE TOP! nutella is one of my fave things ever - i am loving this and thanks for the shoutout! Mmmmm...Nutella. I ate that all the time when I was abroad in Australia. I am not much of a sweets person so my last treat - animal crackers - is pretty boring! 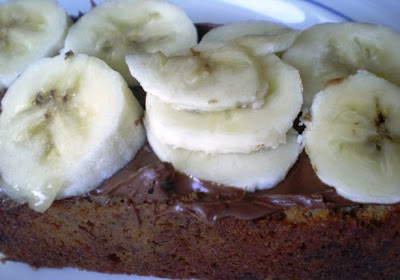 You can't get more perfect than Nutella on banana bread!! OMG, my daughter loves nutella so much - but she can eat a whole jar in a week - so I hide it for her! I don't have many sweet treats, but I did have a sliver of my carrot cake I recently made for birthdays - its so good! Yummy. 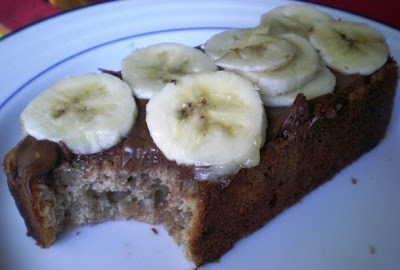 I made banana bread last night as well, but I have never thought of addinf Nutella to it. Must try that soon. Wow that looks good. Having a calorie deficit really works but sure makes it hard to read food blogs. I still love all of your recipes, ideas, photos, and tips. Thanks. Andrea- that looks amazing. What a great combo!! The last delicious treat I ate was an amazing little bowl of Belgian chocolate ice cream- it is incredibly rich ice cream with chocolate chunks - delicious. I had this delicious homemade cream puff yesterday with a fluffy custard speckled with vanilla bean. The pastry was flaky but light and yummy as well!